Summer or winter, this one remains everybody’s favourite. The fresh sight of hawkers selling it like hot cakes outside schools, parks and even apartments is a common sight. The one that has no haters. Yes, in this issue of Good Health, Naturally we discuss all the amazing health benefits of tender coconut. In scientific terms, the tender coconut water is the suspension for the endosperm of the coconut during the nuclear phase of development. It is known as Elaneer in Tamil and Nariyal Paani in Hindi. Tender coconut is rich in electrolytes, minerals, vitamins, complex carbohydrates, amino acids and other nutrients such as potassium, sodium, calcium and magnesium. What does Tender Coconut contain? Tender coconut is a good source of B-complex vitamins such as riboflavin, niacin, thiamin, pyridoxine, and folates. These vitamins are essential in the sense that the human body requires them from external sources to replenish. It is also an instant source of energy for people after tiring exercise regimes or after a strenuous day of work. 100 g of tender coconut provides 79kJ of energy instantly. Tender coconut is served in its raw form or canned and packed for longer use. The best part of tender coconut is that is best suited for all age groups- from children to the elderly. Also read: Have you taken our #FoodQuiz? Click here! It is considered the ideal choice during summer when children are low on immunity and tend to fall sick often. Also when down with viral fever, it is known to restore the electrolyte imbalance in the body. Tender coconut intake has also proven to be beneficial in the treatment of kidney and urethral stones. Coconut water is composed of many naturally occurring bioactive enzymes such as acid phosphatase, catalase, dehydrogenase, diastase, peroxidase, RNA-polymerases etc. In effect, these enzymes help in the digestion and metabolism and hence is suggested for people who suffer from indigestion or gastric troubles. It also helps in easy digestion and is hence served as a welcome drink in restaurants and in party meals. Research studies suggest that cytokinins in coconut water is found to have significant anti-ageing, anti-carcinogenic, and anti-thrombotic (anti-clot formation) effects. The calcium content helps in strengthening the bones and is thus suggested for small children. It is also known to aid in the quick absorption of the drugs and makes their peak concentration in the blood easier by its electrolytic effect. 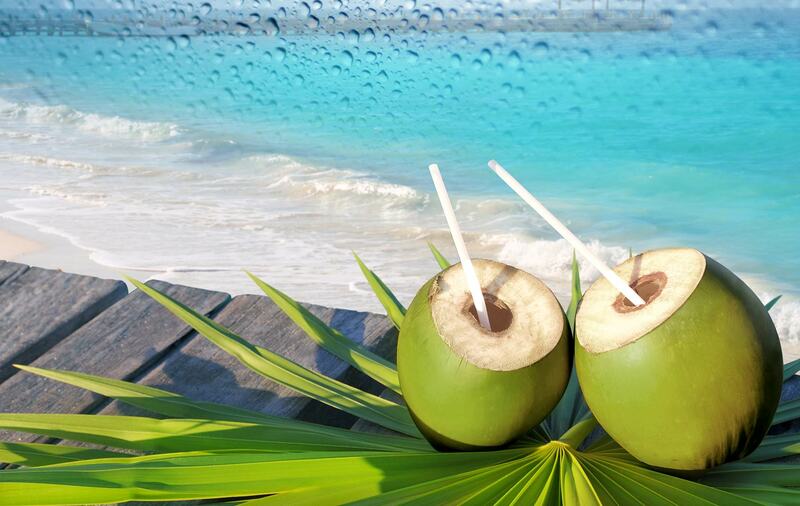 The above being said coconut water tends to lower the blood pressure according to some reports. Hence those under blood pressure medications or any other specific medications are advised to consult their doctor before introducing tender coconut into their diet. Apart from adding it to your regular menu in raw or canned form as mentioned, coconut water has also been creatively added to recipes by food connoisseurs. It is combined with mango/pineapple/papaya/muskmelon/cucumber to often make smoothies. Elaneer payasam is another famous dessert option in the south. The famous Aapam– a signature Kerala dish involved coconut milk/coconut water along with rice batter in the preparation stage. It is also added during the cooking of rice to enhance the taste for special brinji or pulao recipes. Go creative and add a dash of tender coconut to your daily menu!